In a small bowl, stir together mayonnaise and Asian chili sauce. Spread mayonnaise mixture on roll tops; set aside. Layer sliced cucumber, radishes, chicken, shredded carrot, cilantro and sliced jalapeno atop roll bottoms. Whisk together rice vinegar, toasted sesame oil, sugar and crushed red pepper. 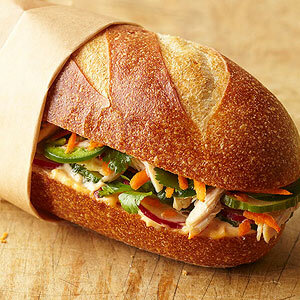 Drizzle over chicken and vegetables in sandwich. Top with sliced jalapeno and replace roll tops.